Hey guys! 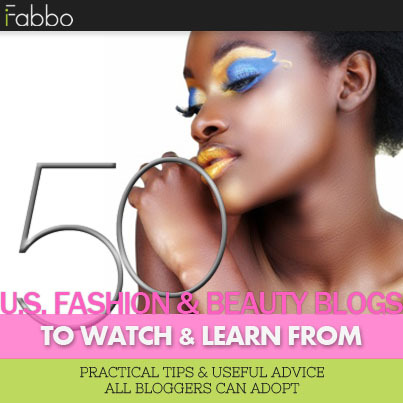 Today's post is a quickie of what I have on at the moment! I'm wearing Kiko Sugar Mat 642 and it is gorgeous! You might have noticed that my pictures look different lol, I'm not sure if it is this polish or what but when I opened it in Photoshop it changed the color drastically. I have no idea why or how to stop it from doing that. So here are pictures of it 100% unedited, no cropping, no watermark, no nothing! Hopefully it looks right to you guys too, I'm always paranoid that my monitor is different that you guys or if I'm doing an okay job capturing polishes but I do my best. I could not for the life of me get PS to stop changing the color though, I think it does it all the time but usually the difference is pretty minuscule - if noticeable at all. Does anybody know how to stop it from changing? Maybe I just need to find a new software to use, I have no idea! Any suggestions? I used two easy breezy coat for this, one had really great coverage but it showed a tiny bit of VNL. I hope you are all having a wonderful weekend! Do you guys have any fun plans? Zoya Spring Magical Pixies - Swatches & Review! Hello All! I hope you are having a fantastic week so far! Today I have the Spring Magical Pixies from Zoya! I'm sure you have all seen these so far, and probably everything else I have been/will be posting but I swear Iwill catch up..eventually haha! Sometimes I just really wish there was more time in the day! I swear I feel like the days are going by so fast lately. I guess I have just been doing more than usual, idk! 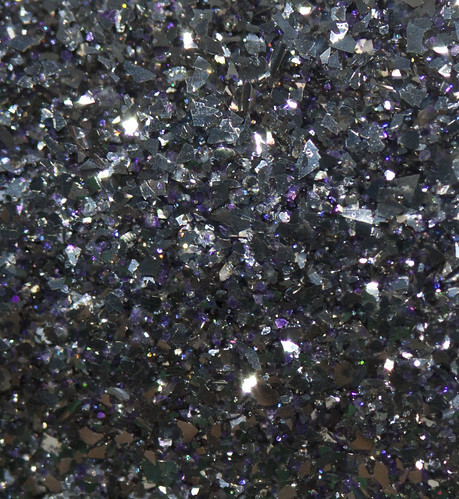 "Cosmo can be best described as a silver crystal sparkle, textured PixieDust with mega hex iridescent particles." "Lux can be best described as a rose quartz sparkle textured PixieDust with mega hex iridescent particles." "Vega can be best described as a blue opal sparkle, textured PixieDust with Mega Hex Iridescent Particles." So the texture nail trend has grown on me more and more overtime since it first emerged, I never expected it to but.. I just don't prefer chunky textures like these personally. They went on very nicely and wear well but they aren't my favorite. Out of these three I like Lux the most, probably because it seems a bit less chunky to me lol. 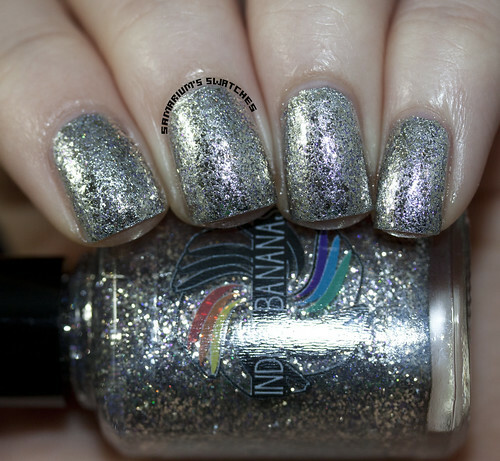 They are really pretty and sparkly, but not my personal favorite for texture polishes. What do you guys think? Do you prefer the regular pixies or another style of texture polish all together? Let me know in the comments section! You can purchase these from http://www.zoya.com/ for $10.00 each! Be sure to stay up to date with Zoya on Facebook, Instagram, and Twitter! Hi guys! How are you all doing? What are you guys up to this weekend? I'm still doing well, just trying to stay motivated with my health kick lately! Not doing too shabby, 7 lbs down! And my belated Mother's Day gift will get here today! It's an elliptical :D Not exactly a very fun gift but one I wanted really bad that will be really useful for us both. 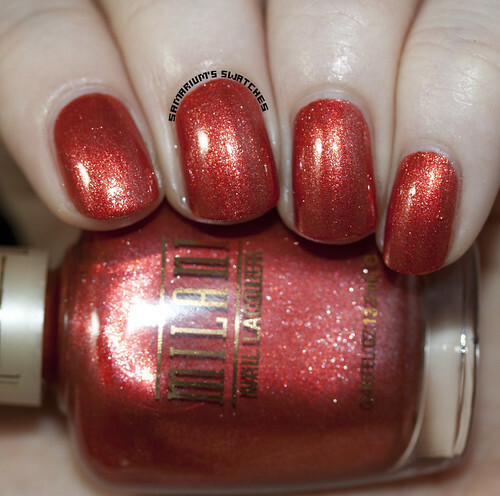 Today's post is featuring the 2014 Milani Gold Label polishes! Showy Sea-Green - Two coats. Popping Pink - Three coats. Splendid Strawberry - Three coats. 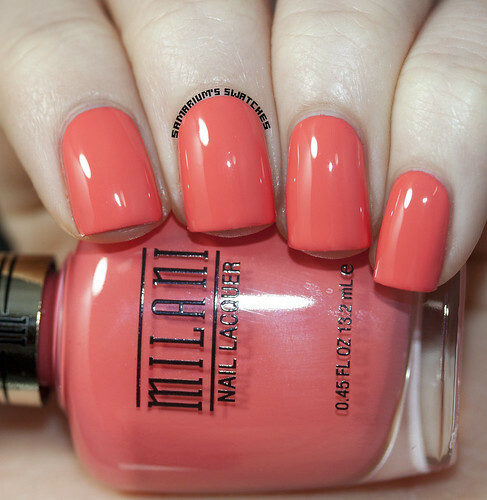 Colorful Coral - Three coats. Vivid Violet - Two coats. Powerful Periwinkle - Two coats. Sugar Coated - One coat over Milani Blue Zoom. Sugar Coated - One coat over Milani Showy Sea-Green. Sugar Rush - One coat over Milani Canyon Country. Sugar Burst - One coat over Milani Heather. Sugar High - One coat over a gradient made with Showy Sea-Green, Aqua Brisk, and Power Periwinkle. 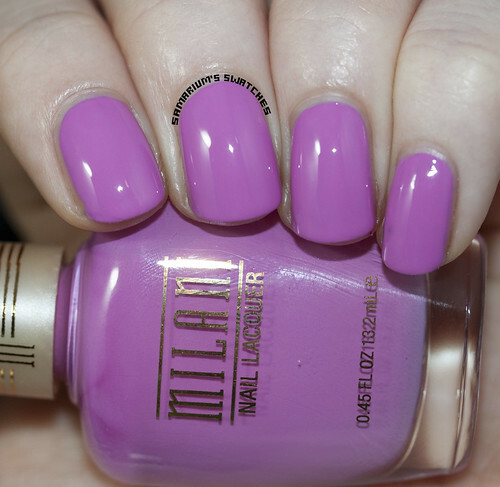 Sugar Cane - One coat over Milani Vivid Violet. 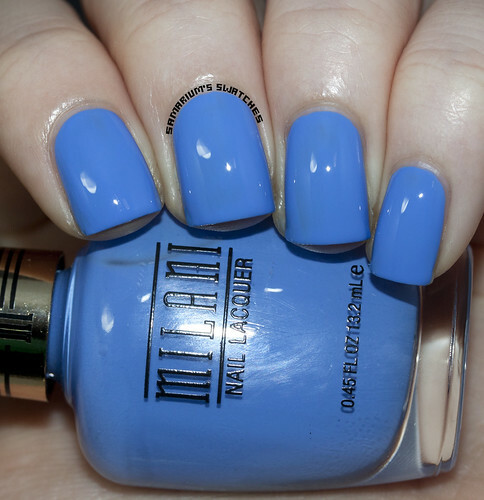 Sugar Rim - One coat over Milani Power Periwinkle. 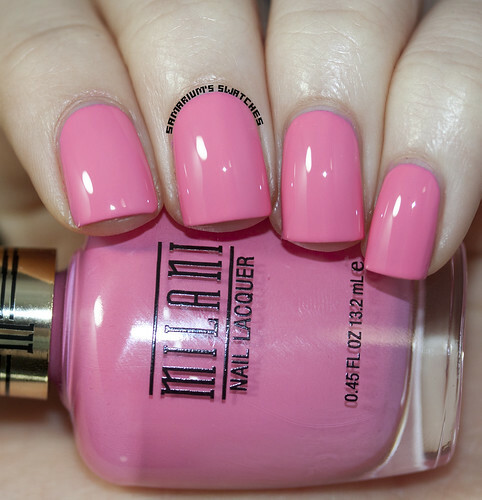 Sugar Rim - One coat over Milani Peach Innocence, topcoated and mattified! I love the cremes in this collection so much! Since I use very thin coats a few needed a third coat. But I think that they are definitely do able with two thicker coats. This polish just doesn't do it for me. 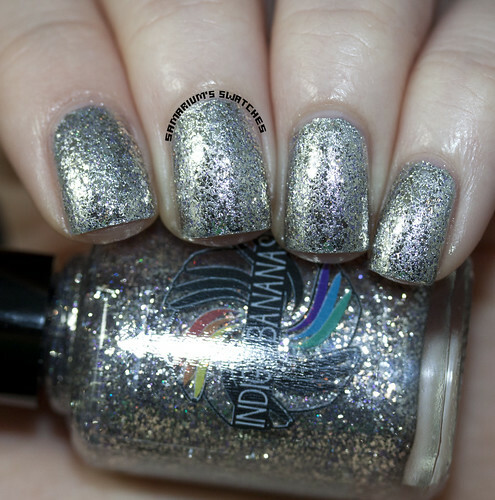 Sugar Rush is a little sparser than I'd prefer but I love the glitter combo in it. The rest had really great coverage and dispersed really well. My favorites are Colorful Coral, Splendid Strawberry and Sugar Rush! The glitters aren't anything to go crazy over but they are nice. Be sure to follow Milani on Facebook, Instagram, and Twitter. Here is a picture of the gradient that is under Sugar High above. 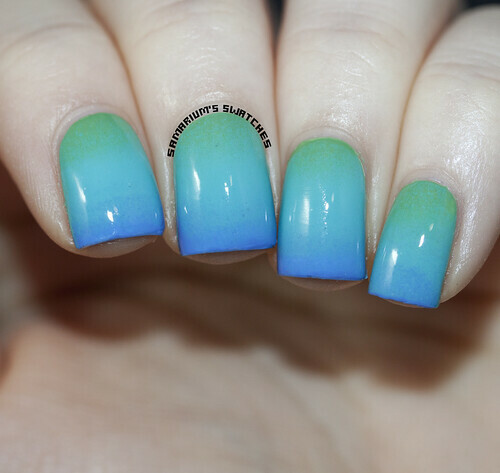 I just love how this gradient came out so much, It was even prettier in person! Are you guys digging any of these shades? I love the cremes so much, they are so bright and summery! Hey guys! 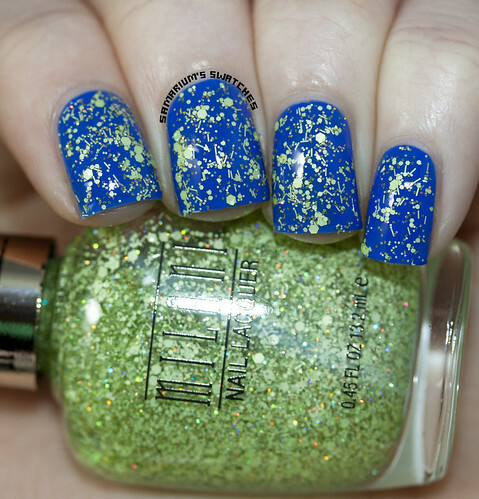 I have a quick, super sparkly post for you all today! I picked up this stunning polish from Indigo Bananas called Moonlight/Clair de Lune. but for optimum sparkle you can build it up on it's own with patience and four coats! It's seriously so reflective and beautiful, if you love silver and sparkly then go get this! I hope you are all doing well and have a great week! 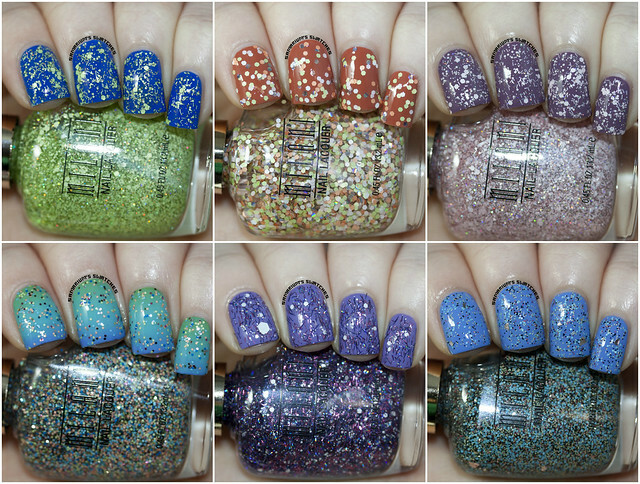 Milani 2014 High Speed Fast Dry Nail Lacquers! Hey guys, I hope you are all doing well today! I can't wait for the new Game of Thrones episode tonight! I have to wait until my hubs gets off of work to watch it with him so until then I'll be watching Starwars! 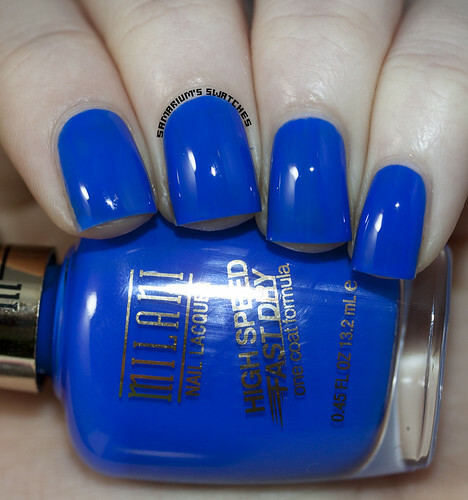 Today's post is featuring two or the three new 2014 High Speed Fast Dry polishes from Milani! Aqua Brisk - Two coats. Blue Zoom - Two coats. Hey guys! I hope you all had a fantastic week! Any fun plans for this weekend? We are going to the mall to get Skylar some new sandals and then heading to Home Depot. Then we will hit the playground! Super fun plans, I know. We know how to party! I've started to work out and eat healthier, which has made a huge improvement on how I've been feeling lately. at the moment and I've failed miserably at losing any weight under the same circumstances in the past! I have to take it easy until my gums are healed from my wisdom teeth extraction the other day, but I will be back at it soon! The past six months have been really rough for me but things are finally feeling like they are falling into place. I'll have insurance again next month so I'll be able to get my dosage sorted out and take my thyroid medicine again. I can't wait to feel better. And If anybody else is trying to loose weight and on My Fitness Pal let me know below! We can help each other stay on track! It's going to be a long ride for me but I finally feel like I can get there. Practically bursting with motivation and optimism! Which is really weird for me honestly. But I'm loving it! 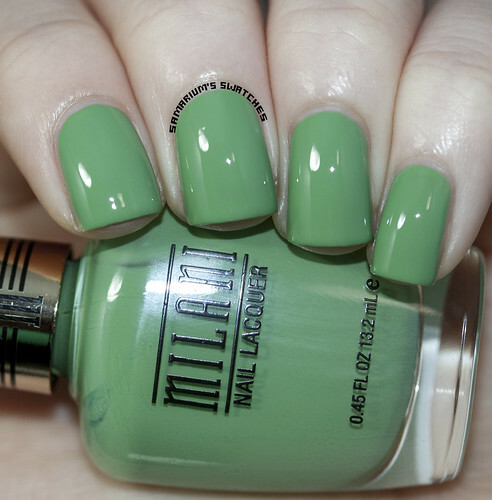 But on to the post :) - Today I have the Milani 2014 polishes on the blog today! Canyon Country - Two coats. Cupid's Touch - Two coats. Golden Romance - Three coats. Iced Mango - Two coats. Mauve Melody - Two coats. Mulberry Sugar - Two coats. Peach Innocence - Three coats. Vanilla Almond - Three coats. I'm really loving this assortment of colors, and they all (other than White) had good formula's and applied easily. The White in this collection was streaky and a little thin, I'd definitely recommend Milani's High Speed Fast Dry's white (White on the Spot) over this one. It's my go to white polish! My favorites of these are Canyon Country, Mulberry Sugar, and Golden Romance. Golden Romance is so gorgeous! It's hard to capture and just so much more stunning in person. 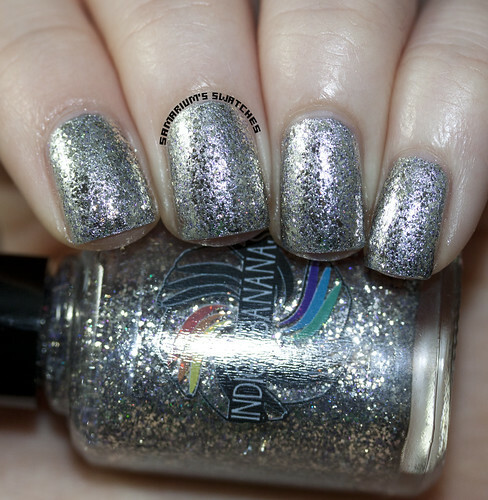 It also looks like a dupe for A England She Walks in Beauty! I need to do a proper comparison though. Have you picked any of these up? Do you plan to? Milani is my favorite drugstore brand and so well priced! 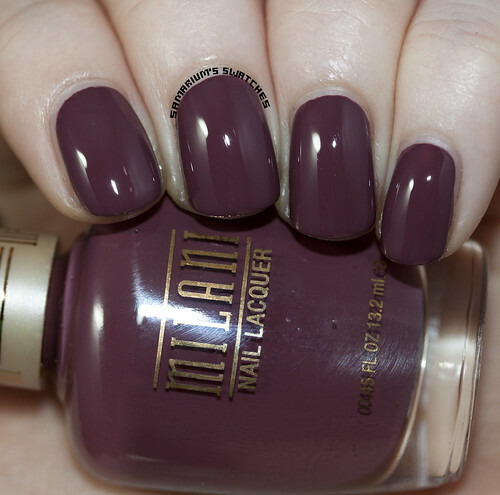 I love their polishes and makeup so much!